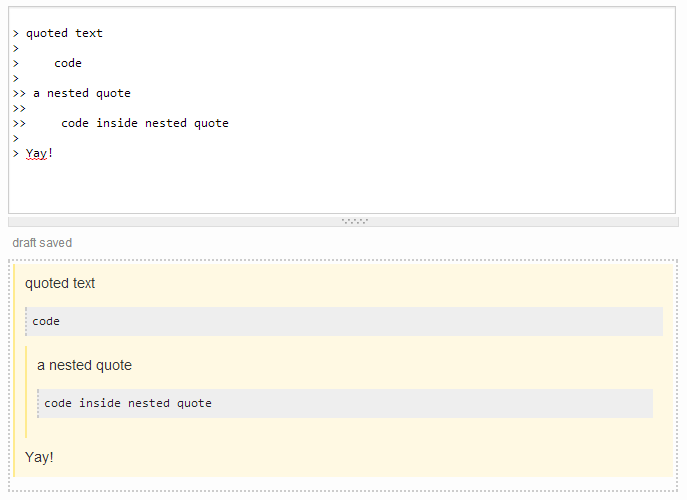 or inline code in a block quote. Sure, the formatting still makes it slightly visible, not very. I’d say the code background should be kept, but the blockquote background should be changed. Why not use a semi-transparent background-color so that nested blocks become increasingly dark? This would also look nicer for deleted posts (red background) and posts animated with jquery ui's effect("highlight") (yellowish-orange background) as it would simply darken the underlying background color rather than staying a static grey. I swear I didn't steal AeroX's idea. This follows from my suggestion here. Note how visual flow isn't broken by quotations but they're also distinct from surrounding text. Citation from OP is muted (it's available within same page but it's copied for clarity, moreover different color - even if muted - will also help to quickly identify each section). Citation from another source has same visual importance as answer text (because it's part of it and it completes answer). I'd also support <cite> tag (now it's unsupported and it's not styled), it's especially useful for external resources. First of all I'd avoid to use only different background colors (as suggested in other answers) because of it won't work with color blind people (around 8% of male population). I think quotes doesn't need a strong visual appearance, what you need is a subtle visual element to make it clear. Extra borders may make text nicer and more elegant (IMO) but they don't really improve legibility (creating a too strong separation between paragraphs) so I'd avoid them. Colors may also be used but risk is to make page too noisy and they should chosen carefully again to avoid confusion for color blind people. Moreover inline <code> has a lighter background than a code block. I think it's good to reduce "visual noise" of the page. 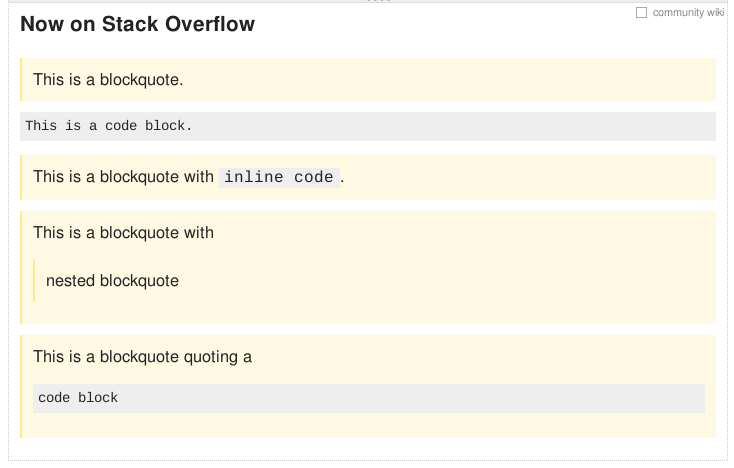 Anyway, whatever is the style for inline or block code, I think to make <blockquote> less prominent will greatly improve legibility and it'll match globally accepted typographical conventions (here it's StackOverflow to do something strange: why quote is highlighted compared to normal text?). The main purpose of a blockquote is to separate a large section of text — quoted from an outside source — that is relevant to the source material at hand. A pull quote is a quotation or excerpt from an article that is typically placed in a larger or distinctive typeface on the same page, serving to entice readers into an article or to highlight a key topic. The [aside] element can be used for typographical effects like pull quotes or sidebars, for advertising, for groups of nav elements, and for other content that is considered separate from the main content of the page. It’s not appropriate to use the aside element just for parentheticals, since those are part of the main flow of the document. What I care (here) is not HTML page code itself but visual appearance those quotes should have. IMO it should be clearer if we're quoting OP or we're quoting an external authoritative source. 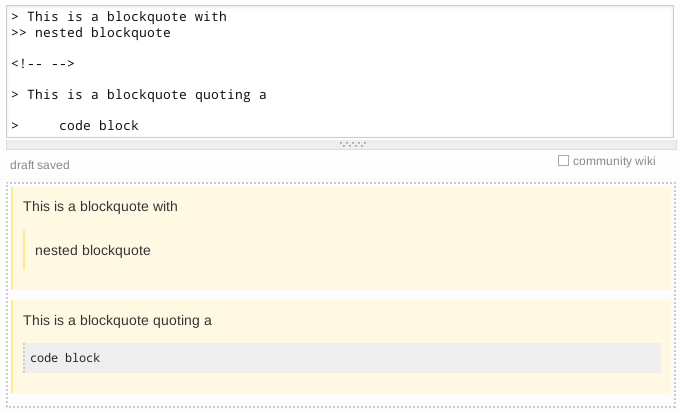 Adding to @unor's answer, Software Reccomendations (among other sites) has not only got the difference between quotes and code blocks right, but also nested quotes and quoted code blocks right. Not the answer you're looking for? Browse other questions tagged feature-request status-completed design code-formatting . Can we have proper formatting for console output?